What Books Press, 9780984578221, 172pp. Fiction. This remarkable debut work brings together two powerful novellas that take a hard look at twenty-first century Southern California life and come up on the wry side of compassion. 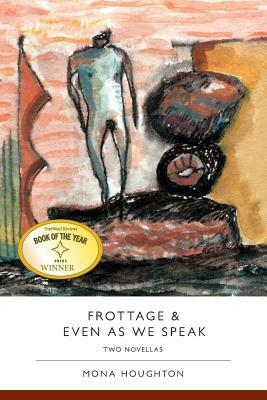 In a twist on the epistolary form, FROTTAGE collects letters from a patient to her analyst that plainly, sometimes shockingly, hide in writing what should be said out loud, piecing together a narrative of sibling secrets and their troubled aftermath. EVEN AS WE SPEAK takes place a few years after 9/11 and follows six disparate characters whose lives crash at the story's start. From the eco-terrorist whose disaffected wife has threatened to expose him, to the college student whose life is tragically complicated by her parents' love triangle, to the middle-aged accountant escaping an alcoholic lover all of them are, in one sense or another, on the lam. By sheer circumstance, they all end up in the same roadside gas station on the same afternoon, at which juncture their lives get entangled.